Staying on top of all the hardware, software, and other IT products used at your company can be a virtually unmanageable task. However, companies that do not monitor and effectively manage their inventory risk having to deal with licensing problems, over-worked help desk employees, and a high volume of IT asset maintenance tasks. Detailed inventory data for all software applications and devices used within the company network, from desktops and laptops, to printers and routers, through to mobile end devices. Maintain an overview of what hardware and software products you use, which systems they are installed on, and how often they are deployed. This way, you can uninstall unused applications, cancel superfluous licenses, and reduce IT costs. If your inventory is integrated into the Matrix42 Service Desk, your employees can quickly determine which hardware and software products any particular system is equipped with. Searching for errors will also be easier: You can track what changes are carried out in the system. Matrix42 Inventory scans your systems within just a few minutes, without the need for you to install a software agent. The scan will account for local systems, as well as all devices that are integrated within the company network. Track user behaviors for data-driven decisions at the management level and in the purchasing department. 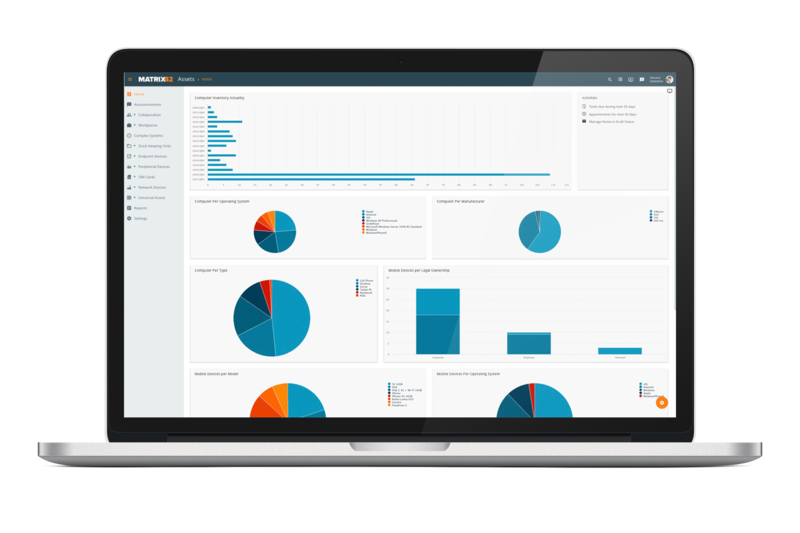 Get an overview of your entire IT inventory at a glance and manage this inventory via a centralized console. Benefit from functions such as blacklisting and whitelisting (when determining which applications are to be inventoried), as well as the alarm function that notifies you when changes are made to your systems. Matrix42 Inventory is a module that is included in Matrix42 Software Asset Management and Matrix42 Unified Endpoint Management. The module can be seamlessly integrated into a comprehensive management console, along with the solution’s other modules. The Matrix42 License Intelligence Service (LIS) is a module of the Software Asset Management product and can be seamlessly integrated into a comprehensive management console along with the other modules of the solution.